Now that it’s finally warmed up, I’m loving getting outside again. And before the extreme heat of the summer hits, I want to get out with the family and hike some new trails. I love going for hikes—they’re such a great way to enjoy the great outdoors and get some exercise at the same time. Experienced hiker Jeff Alt shares his tips today on making hikes fun for the whole family. And Jeff has experience. Not only does he have a hiking resume several thousand miles long, but he brings his kiddos along. He’s walked the 2,160-mile Appalachian Trail, the 218-mile John Muir Trail and has a couple of hiking books to his name (A Walk for Sunshine and A Hike for Mike). 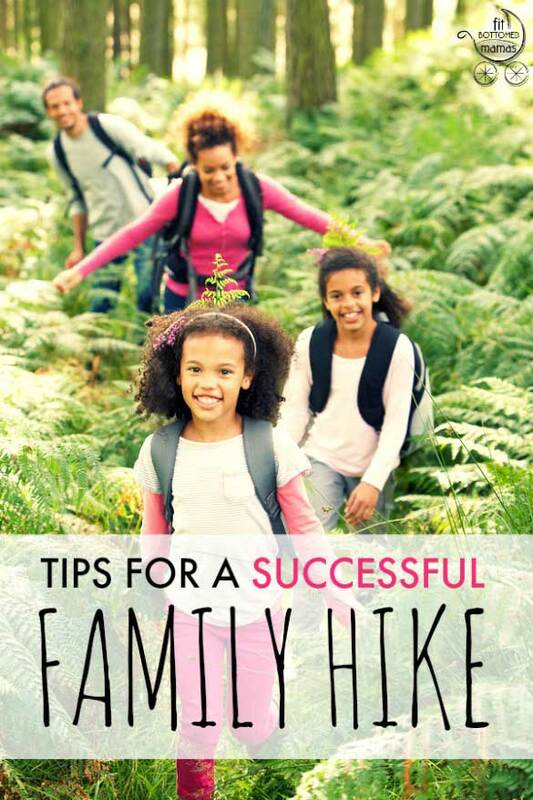 Read on for family hiking tips from a pro! Kids don’t need to be mobile to enjoy the great outdoors. You can hike with an infant, provided you’ve got the right gear and mindset! Start young. Infants and children weighing less than 15 pounds should be carried in a frontcarrier or a sling. Children weighing 16 to 40 pounds can fit into a child-carrierbackpack. Children weighing more than 30 pounds might be ready to hike short distances and carry a little daypack. Use your best judgment. Let the child lead. This helps you focus on what they’re interested in—and keeps you from leaving them in your dust. Get outside every day. Take a walk with the family once a day. Walk around the block, go to the park, go to the beach or river. Get maps and books and search out and find new places to go. Also walk to local restaurants, stores and the library. Bring the outdoors inside. Educate constantly to generate interest and enthusiasm. Take lots of pictures of the kids and places you go. Get magazines, videos and artwork that show places you want to go. Rent movies about faraway places. Use the Internet together to look at maps, and photographs of the wildlife, environments and spectacular scenery you will be visiting someday. Go high-tech.Turn your computernerds on to the adventure technology(e.g. GPS, pedometers headlamp flashlights, geocaching), and teach them all about how these incredible devices are used for fun, like scavenger hiking. Preparation is the key to a successful hike. Many of the same equipment decisions that you make for your own adventures can be applied to outfitting your children. Research. Research the destination and activity. Have your youngster help you with this. You’ve got mail! Send for maps and guidebooks of the area, and check with the local travel experts on hiking, rangers, guides, etc. Have the packages sent to your children. Plan ahead. Choose a trail that offers easy access to amenities. Having a base camp or prearranged lodging allows you to be a parent, not a Sherpa. Check into transportation options. You should have a plan for what to do if you need to get off the trail. Identify the restaurant and grocery amenities. Not only is it good to know what’s available before you arrive so that you’ll know what to pack, but if the weather turns bad, you can also have an instantly viable backup plan. Prepare and plan what you need based on what you find. What kinds of wildlife can you expect? Will water be available? What are the weather and terrain like? You want to avoid hiking in freezing temperatures, lightning stormsand extreme heat. You want to identify and find swimming holes, wildlife, enjoyable views, and great places to boulder, look at flowers, spectacular trees and wildlife. Acquire the right gear. Get everyone properly fitted into essential gear particularly boots and packs. Dress in layers (synthetics, fleece, wooland waterproof breathable items—avoid cotton). Bring what you need for the weather and conditions you will encounter—rain jacket, hat, shirt, socks, shorts/pants, underwear, bug repellent and sunscreen. Don’t forget to train. Train at home in your neighborhood with your kids before you go into the wild. Practice carrying your child in the child carrier. This will help you adjust to carrying the pack, and your child will acclimate to the routine. Take older children (age 4 and older) on weekly walks so that they are physically conditioned for the journey. Wear your boots and all your gear on your training hikes to condition you and make sure everything fits and works before you leave town. Remember that you’ll need to keep yourselves fueled and hydrated. Hungry bellies equal unhappy hikers and campers! Pack your kids’ favorite snacks. Desirable food will help encourage your kids to eat and stay energized. Pack more food than you think you will need. Test drive the food. If you’re planning overnight trips, try out your food and your stove at home before your trip. Make sure you can cook food the kids will enjoy. When preparing your food, think compact, lightweight and filling. Bring items that are easy to prepare or ready to eat.